No matter how many times I’ve seen an artist or band I love, there is nothing more thrilling than when they come to one’s home base. 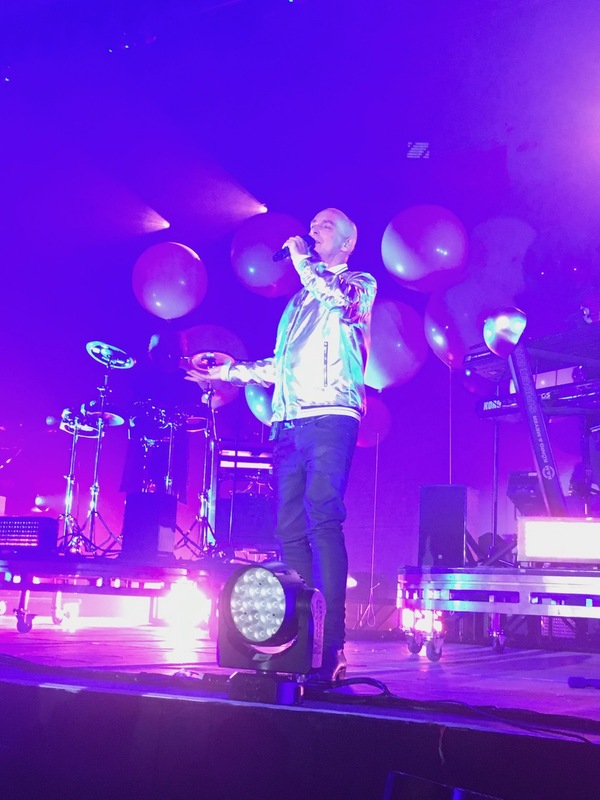 It has been a long time (nearly 10 years) since Neil Tennant and Chris Lowe have graced a Salt Lake City stage with their presence, but Saturday night’s electronic love fest at The Complex broke this dry spell with an energetic and enthusiastically well-received set. Despite the odd setting for the Pet Shop Boys—incidentally still the most successful duo of all time in Britain—it was a puzzling choice, mostly because the venue is too industrial and cavernous. Despite this, the Boys always deliver the goods, and they adapted their latest set (gleaned partially from their recent, excellent Super album) to The Complex’s smallish stage successfully with their talent and charm and simply gave the crowd what they wanted: great dance and pop tunes in dynamic new arrangements. First up was the stage featuring minimalist set pieces—designed and conceptualized again by the stellar Es Devlin—intriguingly beckoning from their pre-show setup. 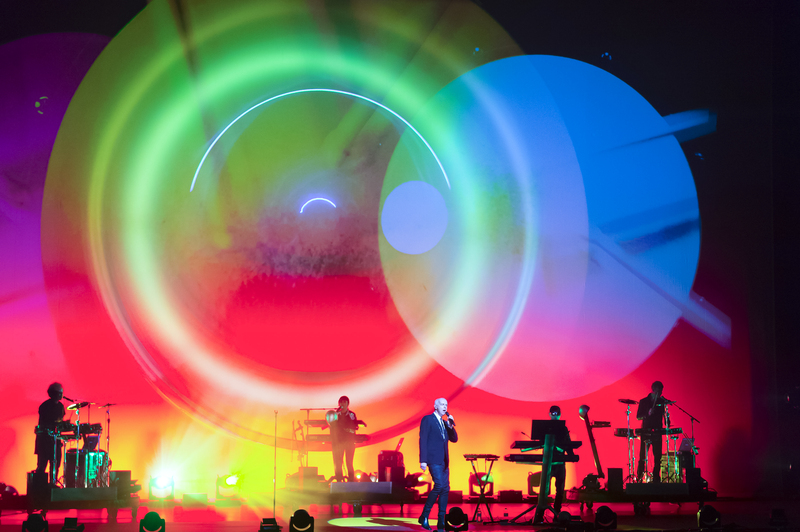 White dimensional spheres (this circular theme has seamlessly been repeated through all of the Super era’s releases, from album, singles, posters, shirts and tour book) flanked both sides of Lowe’s synth and keyboard tower and appeared to possibly be for projections. That turned out to be so only for the first few darkly enticing throbs of “Inner Sanctum” before they thrillingly rotated to reveal Tennant and Lowe, in awesome metallic headpieces, no less, to an adoring mass of their fans. Newer groups would save one of their biggest hits for the end of their show and so it was refreshingly surprising, as those unmistakable bouncy basslines of their classic “West End Girls” arrived so quickly in the set. With tweaked electronic background vocals, that quintessential bass line remains front and center, but what was so delightful was the rare presentation of the original song’s extra verses. It is an early highlight of the night, with many more to come. 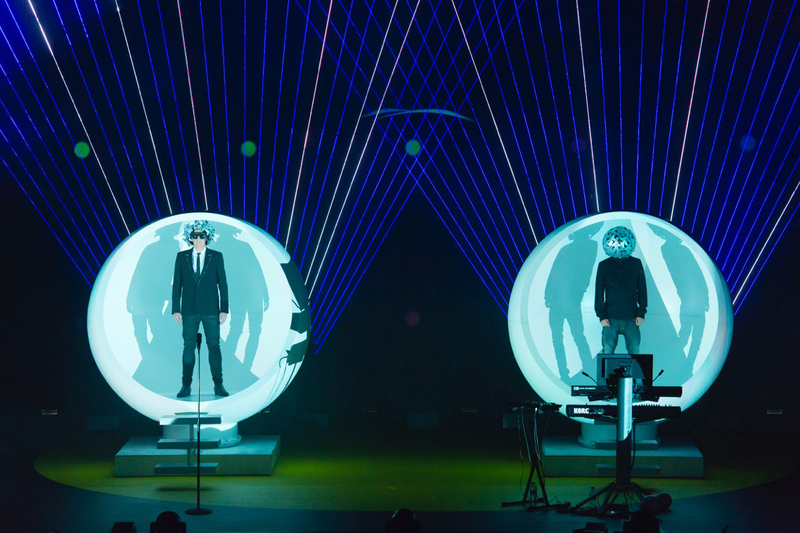 Ranking high as not only one of the best tracks of the year, but also becoming a PSB favorite of mine, “The Pop Kids” is as magnetic and brilliant live as it is on record, and the crowd ate it up. Then another surprise arrives: the early B-side “In The Night,” which is tinged with defiantly pounding drums/synths, an infectious bridge and a near sing-along chorus, and again, the eager fans were in ecstasy. By this time, the stage has expanded to reveal that the Boys are joined by three instrumentalists/backing vocalists. Super’s peak-hour thriller “Burn” suddenly throbs, and Tennant is joined directly by the talented vocalist Christina Hizon, who also plays keys and violins. The lighting is amplified, and the stage is bathed in fiery red hues. Not that the crowd needed to be reminded of their fine songcraft, but Electric’s “Love Is A Bourgeois Construct” did just that, with Tennant’s narrator remaining contumacious to his circumstance. Nightlife’s “New York City Boy” was another crowd pleaser, with the whole joint seemingly singing along to its contagious chorus. One of Tennant’s greatest performance strengths is his Broadway-by-way-of-nightclub delivery. Saturday night found that voice in fine form. Maybe it is the crisp Englishness of his voice, or rather, just the simple uniqueness of his pop vocal style that make one stand to attention, but both talents are on display through a sunny and joyous “Se A Vida É (That’s The Way Life Is)” from Bilingual, which gives way to Super’s millennial cautionary tale, “Twenty Something”—but, being a Pet Shop Boys song, it is also dizzyingly catchy, swirly keys and all. Another evening highlight is early wonder “Love Comes Quickly,” in a lovely new arrangement where Tennant actually joins Lowe on synths. This masterly classic is then paired nicely with Yes’ entrancing “Love, Etc.” The softly sinister “The Dictator Decides” finds Tennant donning a long button-down jacket and Russian hat. 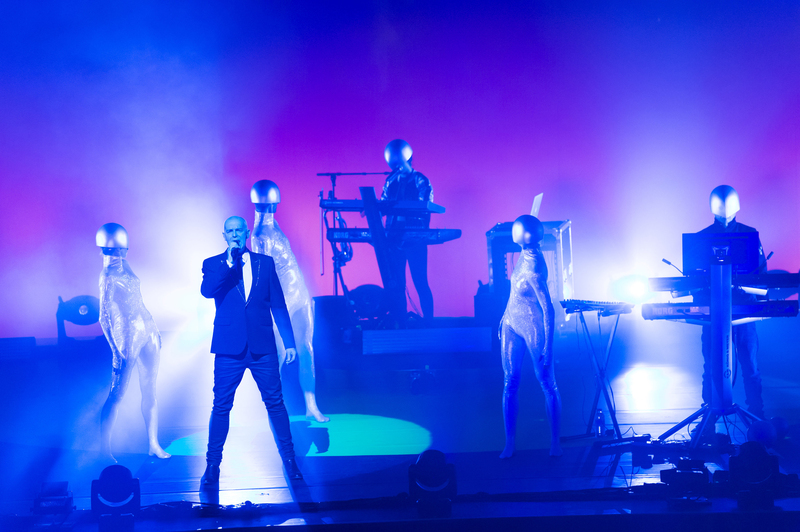 Lowe has also changed headpieces, switching from a space-age helmet to sunglasses, but his stoic poker faces throughout the performance give away little, in typical PSB fashion. Electric’s elegiac “Inside A Dream” introduces a slower part of the evening’s set. It was rather unfortunate—and slightly underwhelming to the crowd—that “Winner” (from Elysium and partially inspired by the London Olympic Games) was performed as the rather staid “HappySad” version, rather than one of its remixes or simply updating and infusing it with some much-needed electronica punch. The otherwise lovely “Home and Dry” also suffered slightly from some off-sounding keys. It is not intended as a criticism that there is usually a breather in the middle of these otherwise high-energy sets—and Tennant especially had earned the right—but with such a gorgeous back-catalogue of ballads and slower numbers, something else could take the place of “Winner.” Fortunately, the set immediately returns to its own high benchmark with “Vocal.” Uplifting and inspired as ever, and lit with great lasers, it elevated the energy that would last for the rest of the show. Besides the aforementioned Hizon, also holding their own onstage are Afrika Green, adding percussion and vocals, and Simon Tellier on additional keys, percussion and vocals too. As the teasing, ever-great opening strains of “The Sodom & Gomorrah Show” start, the background trio’s strengths and talents really come out for show. Like our master of ceremonies, Tennant, they appear to all be having a great time. In fact, Tennant frequently comments on how welcomed they feel, even making reference to their 10-year absence. From here on out, it is pure hits: the ironically dramatic “It’s A Sin” pairs very well with the preceding “Sodom”, and the whole Complex is engaged in not only singing along but jumping up and down to its classic beat. Without skipping a beat, the partially rapped/sung spectacle “Left To My Own Devices” just gives the crowd more of what it wants and then leads into closing cover “Go West” (which now seems more associated with PSB than Village People at this stage), and like the best shows, the hungry masses are not made to wait too long for the Boys and company’s return for the timeless bilingual groove that is “Domino Dancing.” This gem is then followed by another cover, and also another Number One hit, “Always On My Mind.” Cleverly, “The Pop Kids” makes a short reprise, and ever the wise showmen, Lowe and Tennant exit the stage on a high, nearly two hours after their arrival, leaving the crowd wanting more and more.